A dramatic video that surfaced online on Thursday appears to show Brazilian federal police officers performing a daring move to head off an illegal drug-smuggling plane on a makeshift runway in southeastern Brazil. "Go, go, go! Let me get around him and I'll close in on the plane," an officer in the speeding car says, according to a Huffington Post translation of the video. A moment later, gunfire can be heard, but it's unclear whether it originated from the drug smugglers or from the police. The camera abruptly shifts angles, suggesting it (or the person holding it) might have been hit by bullets. "Hit it, hit it, hit it!" an officer shouts as the car approaches the aircraft. Then, in a bold maneuver, the police car's driver rams into the plane's tail and then swerves into the side of the aircraft, forcing it to spin off course and come to a stop. Police arrested five people and found over 230 kilograms of cocaine base paste on the plane, which was intercepted while trying to unload the drugs, according to the video's description. This isn't the first time we've seen this: in 2011, an equally dramatic video showed Brazilian police ramming another smuggling plane, smashing their windshield in the process. But don't get the idea that the country's aggressive police tactics are always successful: a video from earlier this month appears to show Brazilian police wildly shooting up a Rio de Janeiro slum from a helicopter in an attempt to kill a notorious drug dealer. 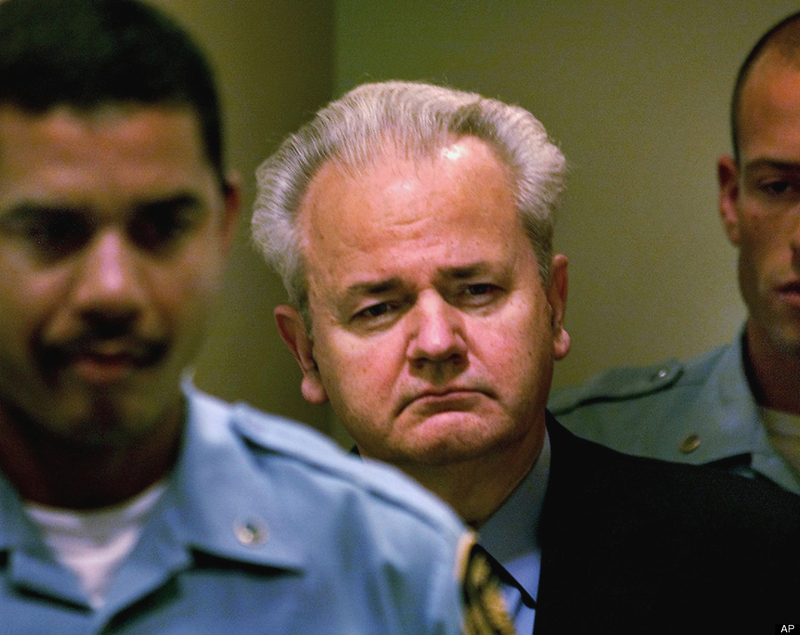 <em>This Tuesday Dec. 11, 2001 file photo shows Slobodan Milosevic, center, as he enters the courtroom to appear before the court of the International Criminal Tribunal for the former Yugoslavia in The Hague. (AP Photo/Paul Vreeker, Pool, File)</em><br><br> The trial of the former Yugoslav President on charges of masterminding Serb atrocities throughout the wars that tore apart the Balkans in the 1990s dragged on for four years and was eventually aborted without verdicts when he died of a heart attack in his jail cell in 2006. The trial was repeatedly delayed by Milosevic's ill health and propensity for grandstanding in court.